All of our clubs observed a 1 minute silence prior to their games over the weekend. Saturday saw 4 of our teams in action, 2 home and 2 away. 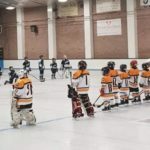 SNL team North Ayrshire Wild traveled to Aberdeen to take on Aberdeen Lynx for what was billed to be a good game. 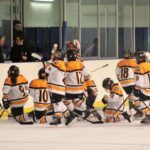 Final Score:North Ayrshire Wild 2 – 6 Aberdeen Lynx. This was the 1st meeting for these 2 teams this season and with the Penguins on a winning streak, they were keen to continue this and were out for the win from the very 1st puck drop resulting in the 1st goal at 2.04 minutes from Lennon Deeney, Solway didn’t like this and levelled the scoring at 5.23 sneaking it past Penguins net minder Calum Simmonds. Penguins dominated this period with 3 goals in 2 & half minutes, Rocco Murray got onto the score sheet and Deeney pulling of a hat-trick to finish off the 1st period. It seemed that Solway’s spirit had been broken. End of 1st period finished 4 – 1 to North Ayr. The 2nd period got off to a flying start with the play going from end to end but it was Solway who were to dominate this period scoring 4 goals, while the Penguins struggled to find a way past the Solway net minder, but Liam Houston managed bring the 2nd period to a close at 5 – 5 and Solway very much back in the game. The 3rd period started badly for the Penguins with Solway finding their way past Penguins net minder Caiden MacColl in less than 2 minutes, but this seemed to bring the fight back to Penguins, who really upped their game and pushed their opponents to defend their net, displaying some great passing and skated right through to find the net 4 minutes later thanks to Aaron Stewart, the score was now leveled so the pressure was on both teams. 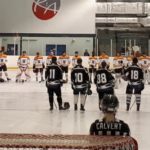 With this game so close the atmosphere round the rink was electric with both sets of supporters cheering on their teams. It was the Penguins who found the back of the net thanks to a fantastic breakaway goal from Rocco to put us again, in the lead. With tensions getting high & both teams desperate for a goal, Solway found themselves a player down, sitting out a penalty for tripping, With North Ayr having an extra player thing were looking good for them. 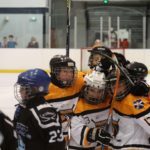 With 50 seconds left to play, Solway gambled and pulled their net minder, giving them an extra outfield player….Penguins took full advantage and with some excellent passing play the length of the rink from Houston to Deeney it was Captain Flynn Massie who netted it with 11 seconds left on the clock. Goals from: Hat-trick from Lennon Deeney, 2 x Rocco Murray, 1 each from Liam Houston, Aaron Stewart & Flynn Massie. Assists from: Jacob Woods, Matthew Evans, Emma Lamberton, Liam Houston, Flynn Massie, Rocco Murray & Lennon Deeney. 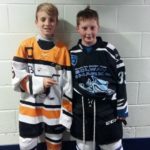 Man of the Match: Solway Sharks JIHC: Logan Reid – Net minder. Devils v Solway Sharks U20’s. Final Score 16 -2 to Solway. Man of Match: Matthew Miller. A big turnaround from Saturday night, Saw the Devils come out as winners tonight. Final Score: Devils 9 – 3 Murrayfield. 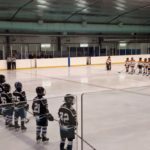 Quiet weekend for North Ayr with only 1 Home game. SNL WILD v Solway Stingrays @ Auchenharvie Ice Rink, Stevenson. Face Off 6.30pm.